I’ve got to be honest with you: Breakfast is not my favourite meal of the day. Although I’m sufficiently hungry – especially now that I’m nursing at night, I don’t have an appetite for anything. I much prefer lunch. 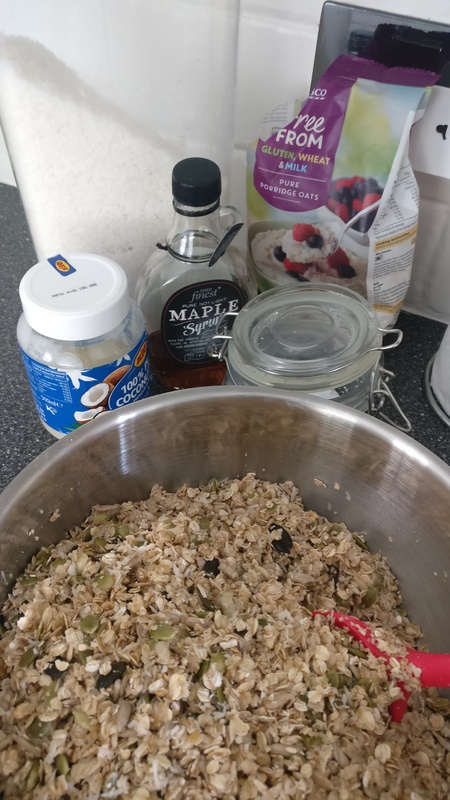 With a hungry baby relying on his food coming from me, there’s no way I can skip breakfast though, so I found a delicious and versatile compromise that is both nutritious and keeps me full for a few hours AND helps the milk production: granola. Many shop-bought granolas have FODMAPS, like wheat, honey or dried fruit. I’m also sensitive to the gluten in oats, so that’s not a viable option for me either. Mix it all well in a bowl and bake in a preheated oven at 140°C for 20 minutes. Stir it regularly to keep it from burning. Once it starts to get a nice golden colour, remove and allow to cool… before you dive in. Granolas are incredibly versatile and you can experiment within your tolerance levels with various ingredients. Just like my maple almond ice cream, I like having a base recipe to which I can add fresh fruit, yoghurt, chocolate (yum!) or peanut butter depending on my mood.